We have come to the end of the 2018 iRacing Special Events calendar! This is a team event. Two Drivers Minimum! The above schedule will have an "Availability" tab! Please put an "X" in the hours which you are available to drive during the race! Please add the number of consecutive stints you are willing to drive (1, 2, or 3) in the bottom row of the chart! @Skid_Marc_, I can be very flexible on cars on Road Atlanta, the only cars I would not drive is the Ford and the Audi. I would kind of like to give the C7 a shot, been practicing in it a little, so that is my first choice. But if we need to fill spots somewhere else, I can do that given enough time to practice. Isn't the race ten hours, not 24? @Bedo will not be driving, he is out of town that weekend. The Audi GT3 first choice or the Ferrari GTE 2nd choice is good for me. I'm just here to fill some holes. I'm driving the DP. Bummer, one of my favorite tracks. Out of town. Hosting a Petit Le Mans session for anyone interested. Just going to start out with a two hour one. C7 or FGT, whatever needs the people. This might be my return to endurance with you guys. My knee is feeling better but i don't want to push my luck. Maybe a 3 man team for me or something along those lines. Throwing up another hosted session. I'm going to be trying the Audi out. Almost gave up on it after a few laps of practice, but finally found a setup that didn't want to kill me. I managed low - mid-1:20's with a setup that isn't completely stable, but also isn't on a knife edge. That said, looks like a stint in the Audi is 45 laps, max fuel consumption was 2.66L/Lap, I ran my fastest lap of the race on lap 30 (1:20.330), but soon I was struggling to stay in the 1:20's. 40-45 were all 1:21's, but that isn't THAT bad. I'm out for Petit this year, cause life. Hosting another practice session if anyone is interested in driving! I'll be in Teamspeak! just did a few laps in the audi with you setup Marc. It is indeed 'stabelish'. However I could do no better than a 1:21:6. 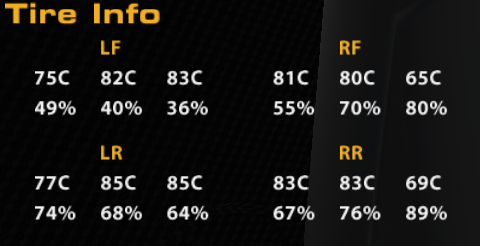 Also, after only 10 laps, FL tire was already 80 something % wear, so double stinting is impossible for mere mortals like me. Don't worry, I think double stinting at Road Atlanta in GT cars has always been a suicide mission.